Posted by Kevin Hetmanski in warmachine. What! Why does this slayer have no head? Or arms! How will he perform Chain Attacks and Power Attacks! And why are my fingers so dirty? Next couple days I’m going to go through the steps of upgrading my ol’ Slayer to something more… sinister. Posted by Kevin Hetmanski in Converting, Lore, Space Wolves. This afternoon I buckled down and looked at my assembled Space Wolves army. They looked very clean and crisp and I realized the problem! I didn’t have a very good “centerpiece”, something to call my own. Most of my stuff is just the builds you would expect out of the box, and I am usually scared to ever do some heavy conversion work for fear of ruining the model forever. So, as a man with a mission I buckled down to create a unique leader for my Space Wolves army. First I decided to think of his backstory, as this is half the fun in collecting a Warhammer army. I decided he would be a Battle Leader in Ragnar Blackmane’s Company, as he promotes rash and heroic deeds of valor. As a name I decided Hodur Sturluson, based off of the Norse god Hodr and the poet who wrote about him, Snorri Sturluson. In the myth, the blind god Hodr was tricked by Loki into killing the beautiful god Baldr, who was supposed to be invincible but had a weakness to mistletoe. I decided to run with this and had a daemon trick him into killing his good friend Baldir. Hodur battles the daemon and shatters his blade before the fiend dissipates into the Warp. Hodur blames himself for his friend’s death and has a particular amnesty against the forces of Chaos and rushes to battle whenever his company has the option to engage. Out of the shards of the daemon’s weapon he forged the shaft to his spear: Baldir’s Slayer, in reference to his friend’s tragic death. 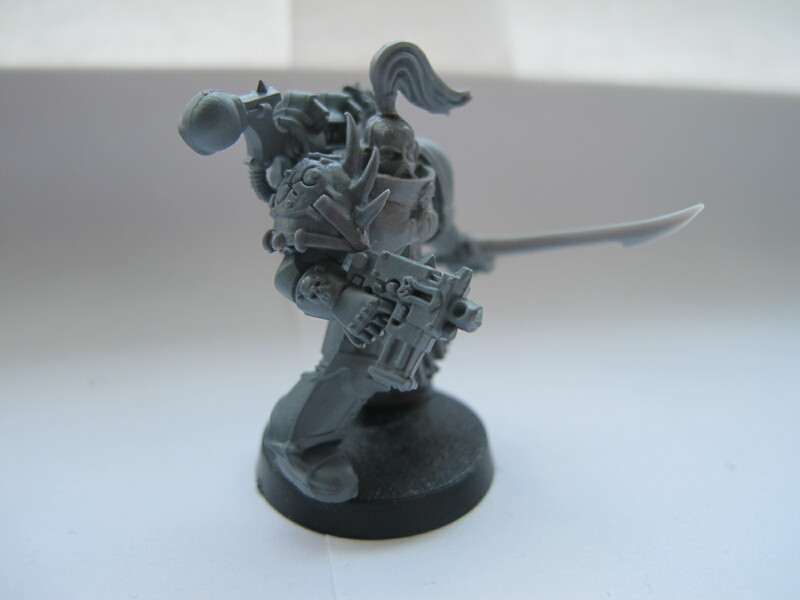 Alright so I roughly had my backstory now I just needed to take a quick look into the Space Wolves codex and build a suitable Battle Leader. So I had my backstory, and I know his general equipment. With this information in hand I begin to build my tragic hero. And here he is! From the get go I knew I wanted to keep him simple but instantly recognizable. The main way I did this was by giving him height, both with the base and the spear. He isn’t actually larger than any of his fellow marines, but through this perspective he just looks more prominent and more important than the others. 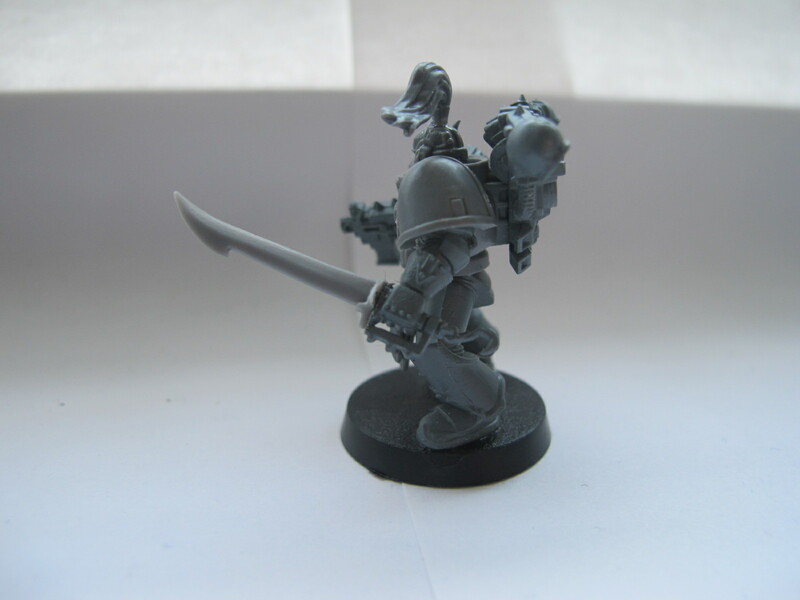 Most of the model was done by just swapping Space Wolves bitz with Wolf Guard Terminator bitz, the only out of faction items are the broken chaos banner he is standing on, and the haft of his spear, which is from the Dark Eldar Raider set. I chose the chaos banner to represent his hatred of chaos (and especially daemons), and I chose the haft of this particular spear because upon closer inspection it seems more foreign and alien to be in the hands of a Space Wolf, which is true considering it’s daemonic origins. The blade of the spear was simply made by cutting off a runic sword found in the Space Wolves boxed set. 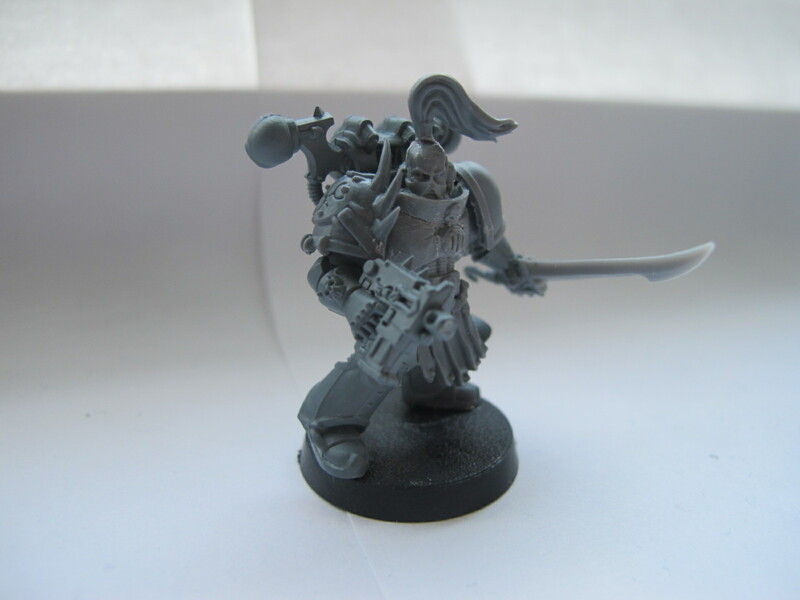 Originally, I was going to give him an Iron Warriors helmet to give him an even more unique look, but in the end I figured it would have been too similar to the Vulkan Hestan model and decided for a head from the Terminator boxed set which shows a lot more emotion. Posted by Kevin Hetmanski in Uncategorized. Sorry Jason, but I had to remove your post about selling the Black Reach boxed set. Please do not use the Roll to Hit Club’s blog for financial gain. So please, no selling minis, posting requests for commissions, etc. This is done to focus the website on our hobbies. There are other websites and other means to get out the news that you’re selling miniatures. This website was made purely for the purpose of sharing what we’re working on, discussing the hobbies we love, and discuss future and current events for the club. 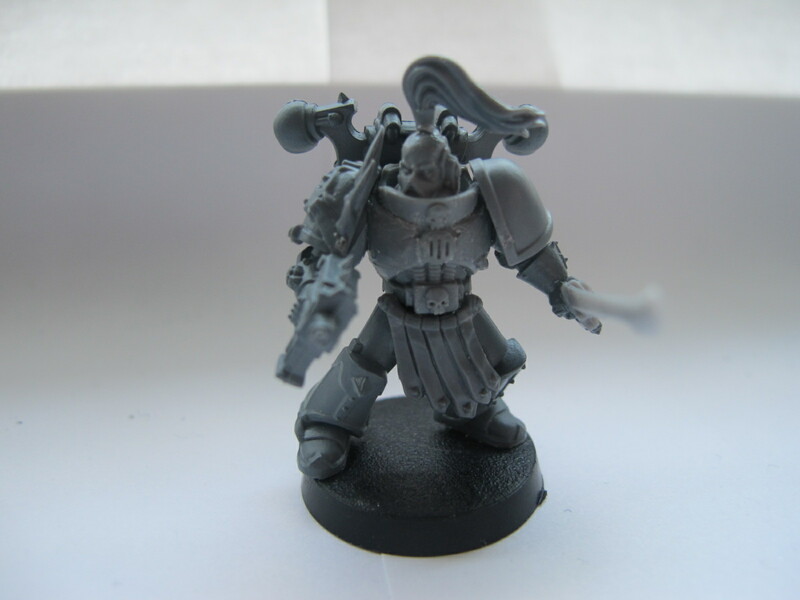 Posted by Kevin Hetmanski in Chaos Space Marines, Converting. Me and Scotland were recently discussing the Emperor’s Children. I know that Scotland usually has a lot of disdain for the Space Marines(of any kind) so when I hear him saying how the Emperor’s Children were pretty cool, I was inspired and offered to convert an Aspiring Champion for him. 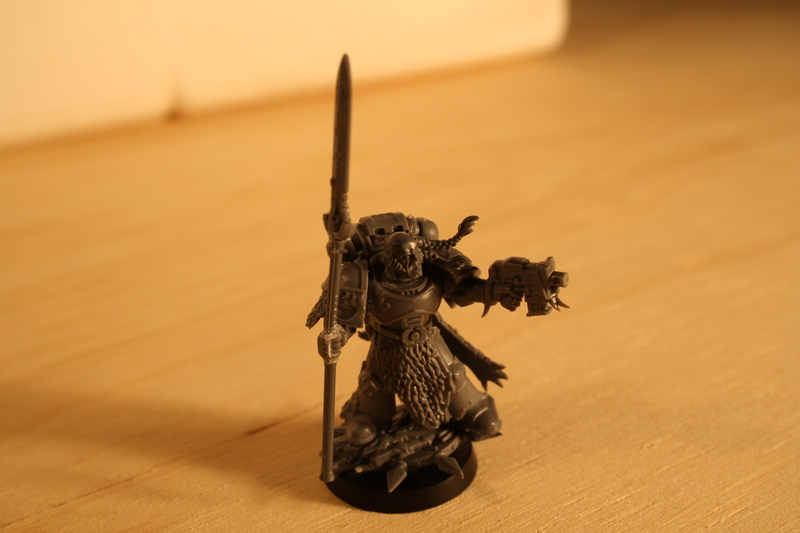 The Aspiring Champion was made out of various Chaos and Vanilla Marine parts, a Space Wolf topknot, and a Dark Elf Warrior blade. My Space Wolves are finally built and ready for some playtime! I followed the army list Brennan did a great job helping me out with but I did make some personal changes I liked and/or thought was necessary. Here is my updated list, expanded from Brennan’s original Pack. The biggest change was upgrading the Blood Claws to Grey Hunters. The reason why I chose to do this was for both fluff and competitive changes. My Wolf Company is Bran Redmaw’s company, and in the codex the Company is known for two things: Redmaw’s Grey Hunters and the unusually high amount of ‘marked’ Space Wolves. Competitivly, Blood Claws and Grey Hunters cost the same, since Grey Hunters can do almost everything and have the superior stats, the only reason you would take a Blood Claws unit is to do what the Grey Hunters can’t. Blood Claws get 2 extra attacks on the charge and can take up to 15 models, in order for me to have any reason to take BC over GH, I would need to field 15 and make sure that I get the charge on the enemy. I wanted to keep my force mobile and didn’t want to have 15 Space Wolves foot slogging across the field and didn’t have the point to get a Land Raider. The switch to Grey Hunters seemed a more reliable choice. The second biggest changes I made was to the Wolf Guard. I really wanted them to be a take all comers unit and I think it really succeeds in that there’s no problem this unit couldn’t handle. The fists and combi-meltas for tankbusting, the power swords for heavy infantry, and the heavy flamer for light infantry. With Saga of the Beastslayer on the Wolf Guard Battle Leader and a Storm Shield in the group, this unit could charge the worst situation and come out looking good. A few other minor changes here and there. Please critique and give suggestions in the comments below. Anyways, it looks like a really fun list and I’ll be sure to post up pictures and battle reports soon. Posted by Kevin Hetmanski in Lore, Space Wolves. In my previous post, I explained a bit about the Space Marines but I only briefly mentioned anything about the Chapter I chose: the Space Wolves. The Space Wolves are easily one of the most recognizable chapters besides the Ultramarines or the Blood Angels. What makes them so distinct is how different they are from other Chapters. They completely ignore the Codex Asartes(the set codes and laws that must be followed by every Space Marine chapter) so that they can follow their own traditions and practices. The Space Wolves use a lot of (you guessed it) wolf iconography when decorating… anything. The Space Wolves are a very martial and anti-authority chapter, they pride honour, loyalty, and strength above all other virtues and are steadfast allies to the armies of the Imperium(but they take every chance they can get to give the Man the one fingered salute). The last thing you want to see charging at you. The Space Wolves recruiting world is the death world of Fenris, among the top 3 most dangerous planets inhabited by man. The planet is locked in an almost permanent Ice Age, and when it gets close enough to it’s sun, the planet’s volcanoes buckle and tear the landscapes apart. The people of Fenris gather together in nomadic warrior tribes, with a culture almost identical to the vikings of Norse mythology(and the theme of Space Wolves). The tribes of Fenris are constantly at war with one another, whether it be for some land to live on or to get some women(What? You need better reasons to go to war?). Only a planet like Fenris could birth a warrior fit to join the Space Wolves. Every chapter is defined by their Primarch. Leman Russ was the Primarch of the Space Wolves. When the forces of Chaos scattered the still unborn Primarchs across the galaxy, Leman Russ found himself on Fenris. Leman Russ was raised by the enourmous wolves of Fenris, until his pack attacked the warrior tribe of Russ, who adopted him afterwards and named him Leman Russ. The Primarch eventually rose to be the King of this tribe. When the Emperor of Man came to Fenris, Leman Russ challenged him to three contests: drinking, eating, and fighting. Leman Russ won the first two, but was beaten in the duel, Russ pledged himself to the Emperor(although he blamed his loss on the alcohol) and he was given command of the Space Wolves. After the Horus Heresy, Leman Russ disappeared after giving a speech to the Space Wolves at one of their feasts. Leman told his sons that he would return to fight Chaos at the end of time, the Wolftime. There’s a brief look at some of the history of the mighty Space Wolves. 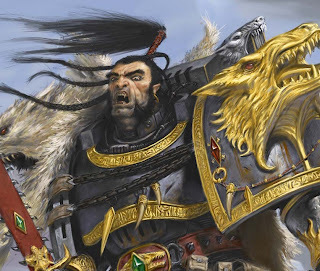 TL;DR : Space Wolves are kickass space vikings that have fangs and chill with wolves a lot. Did I mention space vikings? Posted by Kevin Hetmanski in Army building, Space Wolves. After a few years, I have finally decided to get back into Warhammer 40K. With a lot of encouragement from my friends(with torture the Inquisition would be proud of), the task is left up to me to choose an army, build it, paint it, and play with it. I’ve decided that my journey in this will be a great guide to new or returning players. After reading a few of the Horus Heresy novels, I was set on the Space Marines. The question was whether to be loyalist or traitor. It was a tough choice, Iron Warriors are my favourite Chaos Marines while the loyalists had the Dark Angels and the Space Wolves in the lead. My decision making was purely out of preference, I didn’t search what was dominating the tournaments or who has the most cheese in their army. My decision was based off of how much I like the army, the models, the fluff, the codex. I recommend this sort of method to all new players, doesn’t matter how many tourneys you win if you don’t like the army you’re using! Veteran players always recognize the Space Marines as the noob choice. The Space Marines (and especially Ultramarines) have always had that sort of reputation as the noob army. Don’t let this influence you! The Space Marines are the poster boys of Games Workshop, and with the amount of publicity and expanded universe material they get, it’s no wonder that they remain to be a fan favourite. 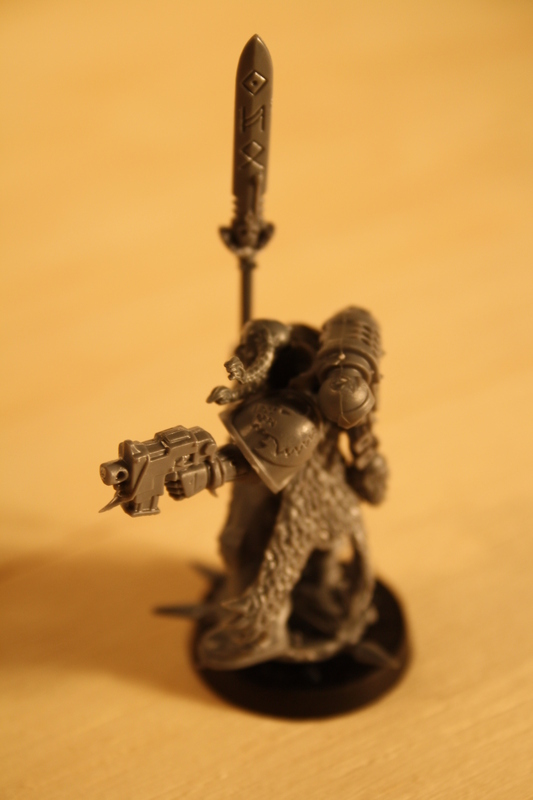 The attractive thing about Space Marines is how customizable they are, from their paint schemes to their codex. 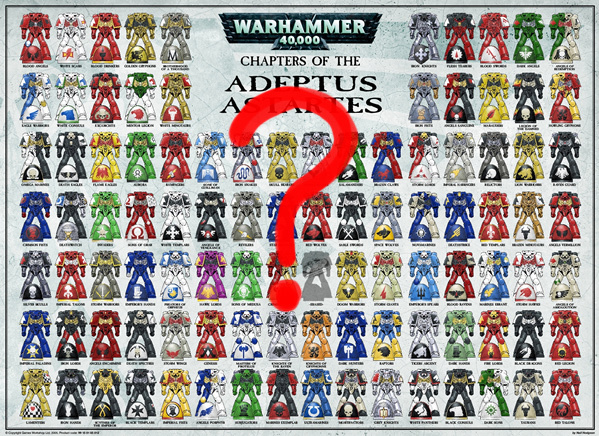 Choosing a chapter or making your own is one of the hardest(and most fun) parts of playing Space Marines. Doesn’t matter who you are, everyone has a Space Marine chapter that fits their style and personality perfectly. After weighing the options I finally chose the Space Wolves, they have a great selection of unique models and the fluff in their codex is just great. I couldn’t ask for a more distinct army. I’m sure the Dark Angels are a bit bitter at my decision, but I think I’ll survive with the Space Wolves at my back. Over the next few weeks I’ll be documenting and blogging the creation of a fearsome Space Wolves army! In the grim darkness of the future there is only war… and that’s how we at First Founding like it!